The debacle was even more monumental than expected. It was historic, worse than 1983. The left—mainly PS—lost 155 communes with a population of 9,000 and over, 49 between 30 and 100K, and 8 cities of over 100K. Those who’ve read about it elsewhere already know the story: the PS managed to save Paris (Anne Hidalgo), Lyon (Gérard Collomb), Lille (Martine Aubry), Strasbourg, and Nantes—and, thanks to a merged list with the Front de Gauche, picked up Avignon from the UMP (and fended off the FN) plus a few others—but it was the Berezina just about everywhere else. Toulouse, which the PS won in 2008, went to the UMP, along with numerous cities that have been Socialist/left bastions for decades, even a century: e.g. Limoges, Belfort, Nevers, Dunkerque, Chambéry, Amiens… The dense network of PS-run municipalities that was painstakingly built up by François Hollande during his period as party first secretary—and particularly in the western part of the country—was decimated in one fell swoop. After the 2008 elections the PS was looking to be the party of cities, the one with the strongest local base, but now the UMP/UDI have taken that mantle (and with the UDI-MoDem, led by François Bayrou in Pau, taking its share of communes, meaning that it will be a big center-right player in the coming years). Even the PS victories in the large aforementioned cities have to be relativized, as the intercommunal governing structures that have been established over the years, and particularly since the 1990s—and which will progressively supplant the communes themselves in local decision-making—, will also pass to the right. So even though Martine Aubry won reelection in Lille she was not happy last night, as the UMP took nearby Roubaix and Tourcoing, meaning that she will lose the presidency of the Lille Métropole Communauté Urbaine, which is almost as important to her as being mayor of her city. As for the future Métropole du Grand Paris, the UMP (Nathalie Kosciusko-Morizet?) may have enough votes to control it when that time comes (January 2016). On this score, the results in the famous ‘red belt’ around Paris were also calamitous for the left (PCF and PS), which, entre autres, lost the communes in the neuf-trois I mentioned in my post last week: Bobigny, Aulnay-sous-Bois, Le Blanc-Mesnil, Livry-Gargan, Saint-Ouen, and Villepinte. By my count the PCF only has six communes left in the Seine-Saint-Denis. And to the list of setbacks one may add Villejuif in the Val-de-Marne, which has been Communist since the 1920s but was taken by the UMP, whose list, in a merger contre nature, included a local EELV fed up with the eternal PCF rule over the town; among the renegade Villejuifois écolos was the gauchiste economist Alain Lipietz (he and the others have been suspended from the EELV for their transgression). My (Algerian origin) in-laws there are no doubt content with the outcome (I’ll have to call them this week), BTW, as their property taxes will most certainly not be raised by the new UMP-led administration. Local taxes were a big issue in this election and across the board. They’ve gone up significantly and just about everywhere, in communes run by the right as well as the left. E.g. in my very right-wing banlieue, the taxe d’habitation has increased by at least 25%—maybe even more (I’d have to do the calculation)—since the 2008 election, and which was one of the factors in the defeat of the incumbent mayor (UDI/ex-UMP) at the hands of his erstwhile (UMP) associate-turned-rival. The ras-le-bol over inexorably rising local taxes will be a big challenge to all the new mayors, as they try to maintain local services plus deal with already high municipal indebtedness. 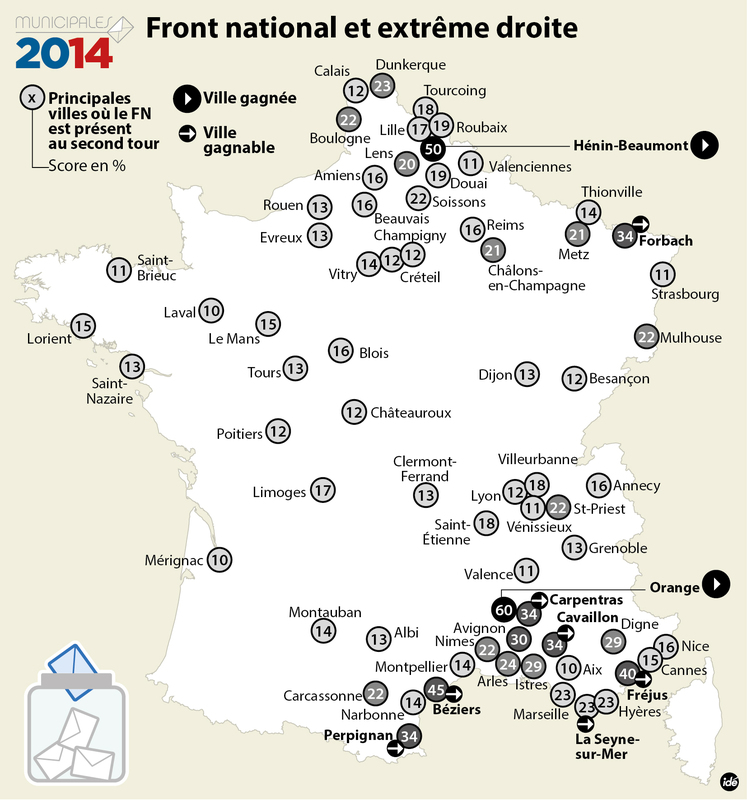 As for the Front National, it won 11 communes. If one hasn’t yet seen the list, go here, here, or here. Notable FN victories include Marseille’s 7th sector, with a population of 150K—it will be interesting to see how the new FN mayor, Stéphane Ravier, gets along with the neighboring 8th sector mayor, la très forte en gueule Algerian-origin Samia Ghali (the only PS tête de liste to win a Marseille sector yesterday)—; Hayange in the Moselle, a dying industrial town and site of ArcelorMittal’s recently shuttered steel blast furnaces that President Hollande promised to save but could not—and whose FN mayor-elect, Fabien Engelmann, is a former trade unionist (in the formerly Communist-run CGT, from which he was expelled for joining the FN)—; and Mantes-la-Ville in the Île-de-France (Yvelines), whose FN list squeaked through to victory due to the (incomprehensible and inexcusable) inability of the two rival left lists (PS and divers gauche) to merge between the two rounds—and, irony of ironies, the mayoral candidate of one having been physically manhandled by Jean-Marie Le Pen in an infamous incident in 1997. But it wasn’t a slam dunk for the FN yesterday, as party heavyweights Florian Philippot and Louis Aliot (Marine LP’s current S.O.) failed to win Forbach and Perpignan respectively, and Gilbert Collard bit the dust in Saint-Gilles. And it needs to be reiterated that Robert Ménard’s victorious list in Béziers was only supported by the FN, with a number of its conseillers municipaux-elect—including Ménard himself—not being FN members. Marine Le Pen and other FN leaders swear that they’ve learned from the fiasco of the FN’s local government experience in the 1995-2002 period—notably in Toulon, Vitrolles, and Marignane—, which was marked by incompetence, amateurism, and corruption—not to mention initiatives such as serving pork dishes only in school cafeterias catering to Muslim students—, and won’t repeat the mistakes. Frontiste communes will, it is promised, be governed more responsibly and professionally this time. On verra. One of the first issues the mayor-elect in Fréjus, 26-year-old David Rachline, will have to deal with is the project—currently underway—to build a mosque in the commune. One would assume that FN mayors, echoing the rhetoric of Marine LP, will take a hard-line against expressions and manifestations of “communautarisme,” a neologism that, translated into American, refers to the asserting of ethnic identities by persons of post-colonial immigrant roots, i.e. from North and Sub-Saharan Africa, and which the dominant French ethos—shared by right and left alike—considers to be a bad thing (but only when it involves communities hailing from the African continent; no one cares if it’s the Portuguese, Armenians, or even Vietnamese or Chinese who do it). The younger generations from these communities are more educated, organized, and assertive in expressing ethnic identities nowadays than in the past, so if FN mairies try to pick a fight with them, a fight they will get. In an analysis of the elections last night, Art Goldhammer wondered if the real political problem in France is less the failings of François Hollande—or of Nicolas Sarkozy before him—than of the French presidency itself, of its seeming omnipotence and the outsized expectations this generates, and that inevitably leads to disappointments on the part of the electorate. Art is absolutely right on this. As he points out, the constitution of the Fifth Republic was tailor-made for one man, Charles de Gaulle, a larger than life historical figure who returned to power at a time of grave national crisis—the Algerian war—and when France needed a strong executive who could assert primacy over the legislative branch of government (and also a seditiously-inclined military). But that historical moment is gone and not only is there no one with the stature of de Gaulle—il n’y a plus de grands hommes—but there is no justification nowadays for an advanced democracy to concentrate so much power (hors cohabitation) in the hands of the executive. It worked more or less for François Mitterrand, though he was saved by the first cohabitation, which paved the way for his reelection, and with his interminable second term ending in failure. Jacques Chirac’s presidency was a failure from almost the get go (and with him winning reelection on a silver platter thanks to the accident of the 21 avril). And the bilan of Sarkozy’s presidency—and now Hollande’s—requires no elaboration. In the case of Sarkozy and Hollande, plus Chirac during his brain-dead second term, the perversity of the omnipotent presidency has been aggravated by the quinquennat and the accident of the electoral calendar, in which the presidential and legislative elections happen one month apart, and with the legislative following the presidential—a sequencing that was decided in a law passed by Lionel Jospin’s gauche plurielle government after the 2000 referendum and was supported by the UDF (but not Chirac’s RPR). What this did was permanently hitch the fortunes of the National Assembly—elected in the wake in the presidential election, axiomatically giving the newly elected president a majority—to the President of the Republic, thus rendering it even more powerless vis-à-vis the executive. The latter calls all the shots. The problem is institutional, not linked to the personality of whoever happens to be the chief resident in the Elysée palace. So in view of the omnipotence of the President of the Republic and the expectations of the French people that he will solve all the problems—and at a time when France, which has no control over its own currency, has less power on the European and world stage than ever, and with an increasingly uncompetitive economy—, it is inevitable that his poll ratings will plummet almost as soon as he takes office and his party massacred in intermediate elections. The next elections—after May’s European—are the regionals, in March 2015. The PS controls 21 of 22 regions in metropolitan France. Anyone want to take bets on how many they’ll be left with after that one? ADDENDUM: The abstention rate yesterday was 38%, which is historically high for a municipal election. But the turnout was nonetheless higher than for other types of elections, notably the European. And way higher than one would ever see in an off year election in the US. If the upcoming American midterm elections could attain such a turnout, the outcome would be very different than the one we’re likely to get (and less favorable to the Republicans). Just sayin’. UPDATE: Rue89’s Pascal Riché explains—with a certain dose of mauvaise foi, he admits—why yesterday’s result was, in fact, a setback for the Front National. Not a bad analysis, actually. There’s almost no question about it: the Socialists are going to get massacred. They could lose as many as 100 communes with a population of 10K or more. The PS’s dense network of local elected officials will be decimated. Whatever governmental remaniement President Hollande cooks up next week will be bien dérisoire in the face of such a monumental setback. Socialist voters are so demoralized and exasperated with their president—it is nigh impossible to find anyone on the left these days who will stand up for Monsieur Hollande—that they will most certainly repeat last Sunday’s performance and stay away in droves from the polls. The UMP will do very well, of course, but all eyes will be on Marine Le Pen’s Front National, which, according to the above map, has a good shot at picking up seven communes—with Béziers and Forbach all but certain—, in addition to Hénin-Beaumont and Orange (whose mayor, Jacques Bompard—re-elected last Sunday with 60%—, quit the FN a decade ago but is no less a facho than when he first won the town in 1995). But the FN and its extreme right allies could, in fact, win as many as 20 municipalities, including several that the map forgot to include: Beaucaire (Gard), Bollène (Vaucluse)—whose incumbent mayor, Marie-Claude Bompard, is not formally FN but is politically identical to her husband in nearby Orange—, Brignoles (Var), Cluses (Haute-Savoie), Cogolin (Var), Hayange (Moselle), Le Luc (Var), Le Pontet (Vaucluse), L’Hôpital (Moselle), Marseille’s 7th sector, Tarascon (Bouches-de-Rhône), Villeneuve-sur-Lot (Lot-et-Garonne), and Villers-Cotterêts (Aisne). To these one may add Villeneuve-Saint-George in the suburban Parisian Val-de-Marne (and near where I live), where the 2nd place divers droite list—which had been endorsed by the UMP and UDI—merged with the 3rd place FN against the PCF-led incumbents. If the FN wins most of these, it will be a political earthquake equivalent to the PS’s débâcle annoncée. 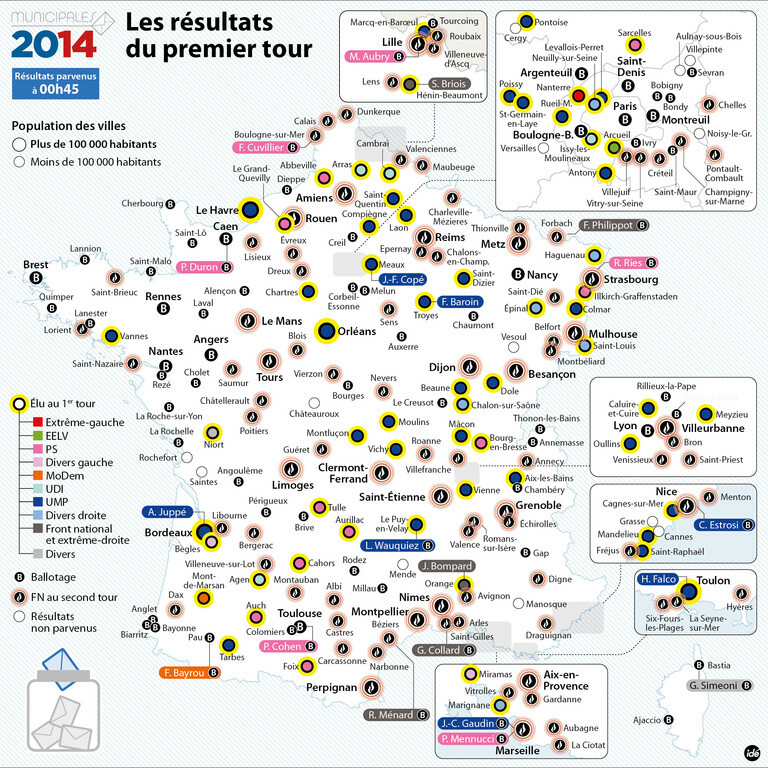 It does appear, though, that Avignon will be spared the FN, with the fusion of the PS and Front de Gauche lists there. For an idea of what may lie in store for communes under FN rule, see this Rue89 enquête from two months ago, on Jacques Bompard’s reign in Orange, “Orange, 20 ans d’extrême droite: «Les cœurs se sont fermés».” Persons of Maghrebi and African immigrant origin—and particularly those who live in public housing—will wish they lived somewhere else. And on Hénin-Beaumont’s new frontiste mayor, Steeve Briois, see this one by Claude Askolovitch in Rue89, “Quand Steeve Briois, 15 ans, jubilait dans un bus rempli d’immigrés,” in which Askolovitch reproduces a passage from his (excellent) 1999 book Voyage au bout de la France: Le Front National tel qu’il est, recounting his experience of following Briois, then a teenage FN activist, around the declining industrial towns of the Pas-de-Calais. Briois, who hails from the couches populaires, developed a youthful antipathy toward his generational contemporaries of Maghreb origin, i.e. the punk was a racist from the get go. Now people do grow up and evolve in their ways of thinking. Or they don’t. Also in Rue89 is this very interesting reportage of the FN’s campaign in Marseille’s 7th sector (13th-14th arrondissements), “La tentation du FN à Marseille: «Il faut bien leur faire peur»,” which may yield it victory tomorrow. One learns, entre autres, that a certain number of Maghrebi voters, driven by opposition to the gay marriage law or simply because they are totally fed up, voted FN. What is clear is that the FN simply does not strike fear in the hearts and minds of a significant portion of the electorate, including voters of immigrant origin who would normally have reason to fear it. 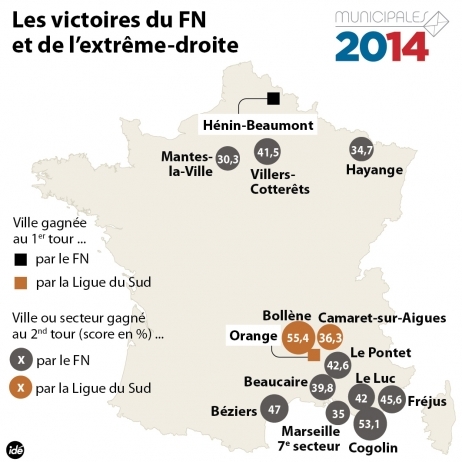 One will have noted that the majority of communes that the FN stands to win are in the southeast. On the regional cleavage in the FN vote, geographer Laurent Chalard, whom I linked to in my previous post on the election, had a good op-ed in Le Monde earlier this week on “Les failles stratégiques du Front national,” in which he discussed the contradictions at the heart of Marine Le Pen’s and the FN’s discourse as they strive to address constituencies with fundamentally divergent revindications: the FN’s traditional middle class/petit bourgeois base in the southeast, which is opposed to state intervention, taxes, and Parisian bureaucrats; and working class voters in the northeast, who fear globalization and favor state intervention in the economy to protect their jobs or restore them. How the FN manages this contradiction—and if the mainstream parties of the left and right can exploit it to undermine the frontistes—will have a significant impact on the party’s fortunes in the coming period. 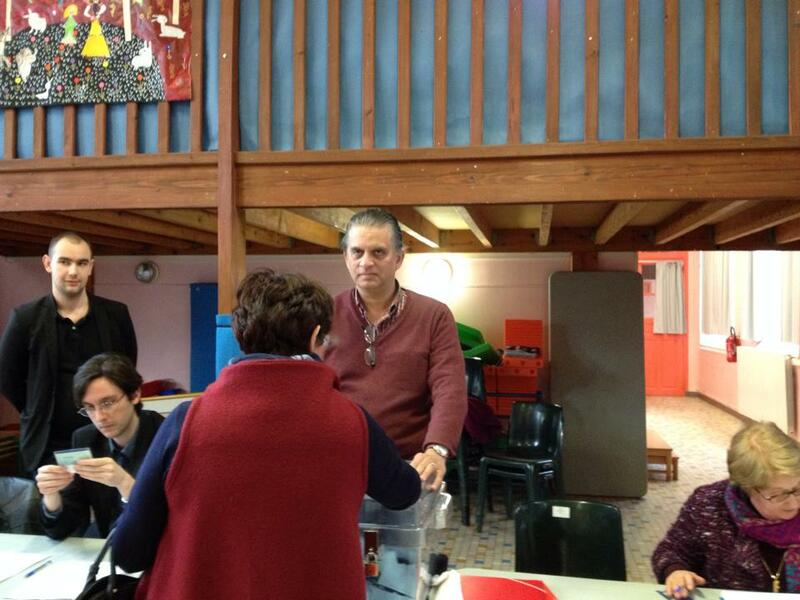 As I did last Sunday, I’ll be working a bureau de vote all day tomorrow as an assesseur titulaire in my commune (where the local right-wing is tearing itself apart in a fratricidal war, as it always does in local elections). À suivre. ADDENDUM: The blog 500 Signatures: French Politics & Elections Blog of political scientists Jocelyn Evans and Gilles Ivaldi is closely tracking the FN’s electoral progress, and with lots of data and statistical analyses. The website of the French journal Esprit has a lengthy interview (en français), “La fin de l’illusion turque,” with Ahmet Insel, who teaches economics and politics at Galatasaray University in Istanbul (and is a founder of the İletişim publishing house). It’s one of the most interesting analyses I’ve read of late on the current political situation in Turkey, and notably on the conflict between RT Erdoğan and the Gülen movement, and the role of the military in this. Insel says that an AKP national vote of 45% or above in tomorrow’s municipal elections—which he deems probable—will represent a big victory for Erdoğan, providing him with the legitimacy to launch an all-out offensive against the Gülenists (not to mention anyone else he feels like going after). But in the (improbable) event that the AKP wins less than 40%, many AKP militants will start looking to a post-Erdoğan era and which may provoke a split within the party, such that the AKP could lose its current majority in the Grand National Assembly. le Premier ministre restera condamné à une posture défensive. Il va passer le reste de sa vie politique à craindre l’ouverture de nouveaux dossiers, la publication de nouvelles preuves accablantes. Qu’elle soit lente, en passant par une phase «poutinienne», ou rapide en cas de défaite aux élections locales, la chute de M. Erdogan est inéluctable. Sooner rather than later, inshallah. What Insel has to say to about the Kurdish question is also most interesting. Erdoğan wants to cut a deal with the PKK but his hands are being tied by various domestic actors, not the least of whom is the nationalist Turkish public, i.e. the AKP base, and its ethnic conception of the Turkish nation. Geographer Laurent Chalard, who teaches at the Université Paris-IV Sorbonne, has an analysis in Figaro Vox of the significant drop in support for the PS last Sunday from voters of immigrant origin. The abstention rates in communes with concentrations of Maghrebis and Africans reached record levels, notably in the Seine-Saint-Denis (a.k.a. le neuf-trois), Paris’s 18th-19th-20th arrondissements, Marseille’s 8th sector (les quartiers nord), and Lyon’s eastern banlieues, and with Socialist-led lists taking a disproportionate hit. Voter participation rates have always been lower than average for these populations and for structural reasons, which Chalard mentions: a voting-age population that is both disproportionately younger and less educated, and with lower levels of political mobilization via intermediate groups or the parties themselves. The latter point I can attest to from personal observation: in my mostly middle/upper middle class banlieue, the only parties/candidates who actively solicit votes in the one cité in town are from the Front de Gauche. The others don’t bother, deeming that there are few votes to be had there—which is the case with the right—or, as with the Socialists and écolos, because they’re not comfortable with ethnic-style campaigning and don’t have a populist economic message to compensate for that, so leave the cités to other parties of the left. A second factor identified by Chalard for the high abstention rate is the government’s policies and discourse on questions de société, i.e. on issues having to do with social mores, notably gay marriage. Voters of Maghrebi and African origin may be on the left when it comes to the economy but are culturally conservative; thus the opposition by Muslim personalities and groups to the mariage pour tous law last year and the disproportionate hysteria in the banlieues over the so-called “théorie du genre” during that preposterous episode early last month. Chalard’s hypothesis is plausible but I’m dubious. It’s still the economy, stupid, and with the immigrant-origin communities—which are inadequately socialized politically and alienated from the system as it is—affected by unemployment even more than the rest of French society. Mediapart has had two enquêtes over the past two days on the disaffection of immigrant-origin voters in the current election cycle and their defiance toward the Socialists, one on the Seine-Saint-Denis, the other from Marseille. 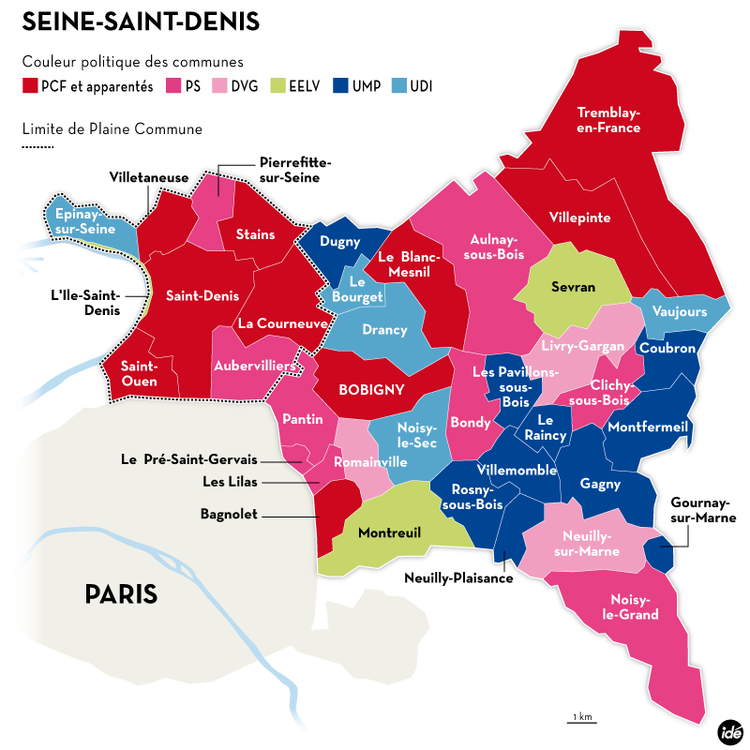 The Socialists’s adversaries in the Seine-Saint-Denis are not only the right—UMP and UDI (the FN is not a factor in the department)—but also the PCF/Front de Gauche. The PS, which made big gains in the department in the 2008 elections and at the expense of the Communists, had high hopes of knocking off the latter in several communes but suffered a setback on Sunday, notably in Montreuil—where National Assembly deputy and rising star Razzy Hammadi was eliminated from the 2nd round and with a humiliating fifth place finish—, Saint-Denis—the PCF’s last remaining municipality of over 100K inhabitants, which it has been running almost continuously since the 1920s—, Saint-Ouen, and Villetaneuse, and with Aubervilliers and Bagnolet in the balance. And the UMP/UDI have a strong chance of taking Bobigny—the neuf-trois prefecture and longtime PCF bastion, the loss of which to the right would be hugely symbolic—, Aulnay-sous-Bois—whose très droitier UMP tête de liste, Bruno Beschizza, is a former police officer—, Le Blanc Mesnil—which has been PCF since the 1930s—, Livry-Gargan, and Villepinte. As for Bobigny, the UDI mayoral candidate, Stéphane di Paoli, seems to be running a smart campaign, at least judging from his list of candidates to the city council, which includes a woman wearing an Islamic headscarf and who is prominently displayed in the campaign’s main poster. And it’s getting publicity outside the commune, as one may see in this dispatch in the high-profile Franco-Islamic website Oumma.com. The video of the exchange between the communist militant and young veiled woman is worth the watch. The latter manifestly understands the meaning of French laïcité more than does the former. If I were a Balbynien, I’d likely vote for Monsieur di Paoli. ADDENDUM: Here’s a post of mine on “the Muslim vote” in the 2012 presidential election, which one poll had at 93% for François Hollande (far more a rejection of Sarkozy than an affirmative vote for Hollande). 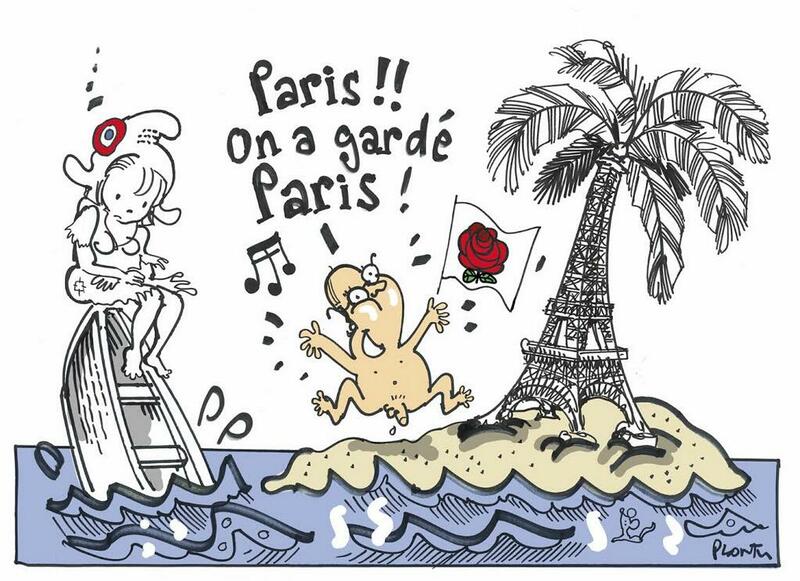 In the Seine-Saint-Denis, Hollande received 65% in the 2nd round against Sarko (N.B. not everyone in the neuf-trois is of post-colonial immigrant-origin or from the couches populaires; there are plenty of regular “white” Frenchmen and women out there). This is not quite an instant analysis and I don’t have much to say about yesterday’s vote that isn’t being said by everyone else, which is that it was a disastrous result for the Socialists—worse than anyone expected or that was projected in polls—, an excellent one for the Front National, and not at all bad for the UMP, and with the backdrop a record abstention rate for this kind of election (39%), reflecting a demobilization of the Socialist party’s base. PS voters disproportionately stayed home—and one needs to specify that it was indeed PS voters, as the other constituents of the left, i.e. 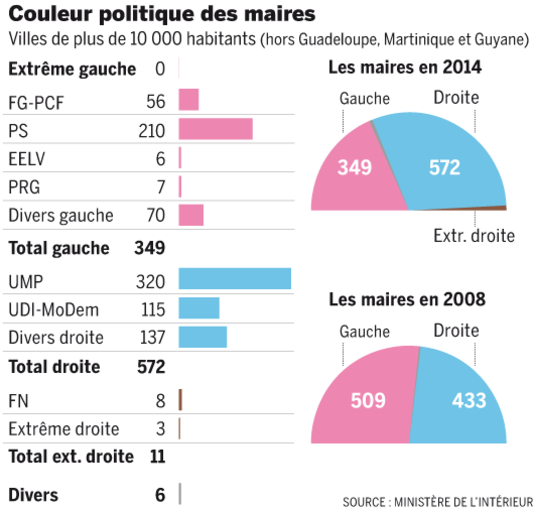 the écolos and Front de Gauche, did well where they ran separate lists. The Socialists are not even trying to spin the result. Patrick Menucci, the PS mayoral candidate in Marseille—who finished in third place (behind the FN) with a paltry 21% citywide, a calamitous score that absolutely no one anticipated—, bravely insisted on France Inter this morning that he could make up his 17 point deficit with Jean-Claude Gaudin but one doubts anyone believes this (including Menucci himself). In my own very right-wing banlieue, where I manned a polling station yesterday (photo below) as an assesseur-titulaire (for the PS-EELV-MRC-PRG-MUP list), the total score of the two left lists was 18%, compared with 21% in both the 2008 and 2001 municipal elections (and with François Hollande receiving 40% in the 2nd round of the 2012 presidential). Two comments. First, on the FN’s result. It was certainly very good for the frontistes but is, objectively speaking, not that big of a deal. So the FN’s secretary-general Steeve Briois won a narrow outright victory (50.3%) last night in Hénin-Beaumont, a depressed industrial town of 25,000 souls in which the party has been investing political resources for years and that Marine Le Pen won with 55% in the 2012 legislative election (losing the larger constituency by a hair). It’s about time the FN won that sorry place. As for Béziers, where the FN-supported Robert Ménard will most certainly be elected mayor next Sunday, it should be specified that he is not an FN member and doesn’t even issue from the extreme right. He was a founder of the civil libertarian Reporters sans Frontières in the 1980s, hung out more with leftists than rightists back then, and was engaged with bona fide, mostly left-wing Algerian democrats who opposed both the military-backed regime and Islamists as that country descended into internecine bloodletting in the 1990s (a product of Ménard’s then support of Algerian democrats was this book). Ménard—whom I don’t know personally but used to see around—was/is a flamboyant, bloviating self-promoter—and, IMO, an insufferable jerk (e.g. the kind who incessantly talks very loudly into his mobile phone in public)—who has found a new outlet for his flamboyant, bloviating self-promotion in Marine Le Pen and the hard right of the political spectrum. It will be most interesting to see how he and his frontiste associates run a city of 71K inhabitants, a third of whom live with less than €1000/month. Likewise with Gilbert Collard, the near certain mayor-to-be of Saint-Gilles, likewise a self-promoter extraordinaire and whose political parcours spans the far right to the far left and everything in between (as I noted two years ago here). The FN managing a handful of municipalities—as many as ten and possibly including Perpignan (but please, not Avignon)—would be a good thing IMO, as Marine LP & Co will finally have some concrete political responsibilities and a bilan to defend. For a party whose national electoral support has been in the teens for the past three decades, it is only normal that it should have at least a few elected officials in executive positions. But again, the number of communes it will be running will only be a drop in the bucket: less than one percent of municipalities with a population of over 10,000. And that will be as good as it gets for the FN. Second comment. The PS may be able to limit the damage next Sunday via at least a partial mobilization of its electorate. Maybe. In Paris, Anne Hidalgo, who very unexpectedly finished behind Nathalie Kosciusko-Morizet citywide, will still likely win next Sunday (as merged PS-EELV lists in the 4th, 9th, 12th, and 14th arrondissements will be en ballotage favorable, and may even take the 5th arrondissement if the right’s warring lists there don’t merge; we’ll know after tomorrow night’s deadline for merging and reconstituting lists). Martine Aubry in Lille, Gérard Collomb in Lyon, and Jean-Marc Ayrault’s successor in Nantes will also win, despite sharp fall-offs in the PS vote yesterday. And Toulouse and Strasbourg look doable. So it ain’t over till it’s over. But whatever happens next Sunday the municipal elections will still have constituted a big setback for the PS and President Hollande, meaning that there will be a governmental remaniement sooner rather than later and most certainly with a new prime minister. As for what good that will do and if it will change anyone’s fortunes, allez savoir… RDV la dimanche prochaine. That’s what this Time magazine article on Turkish PM Erdoğan’s Twitter ban and nationalist demagoguery calls him. As for what a honey badger (en français: ratel) is and does, take a look at this YouTube linked to in the article. Beurk! 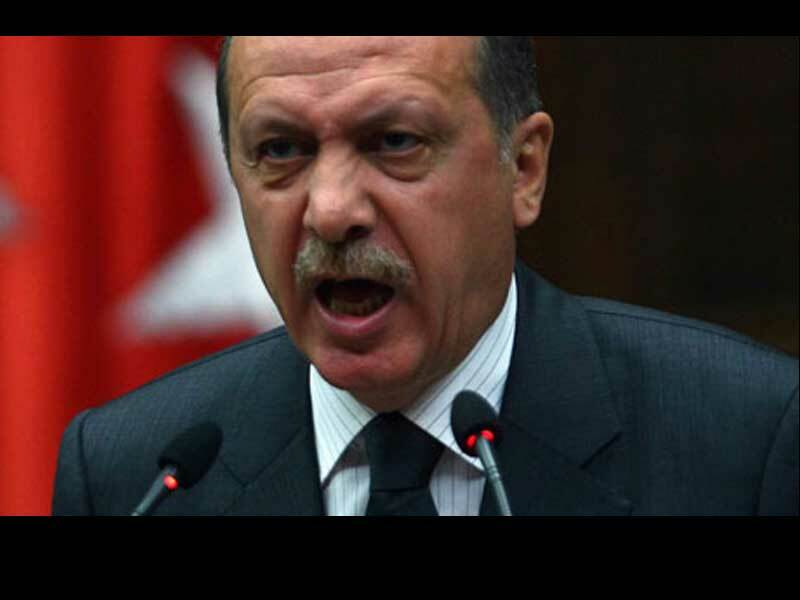 I’ve been trying to decide who’s worse, Erdoğan or Putin. 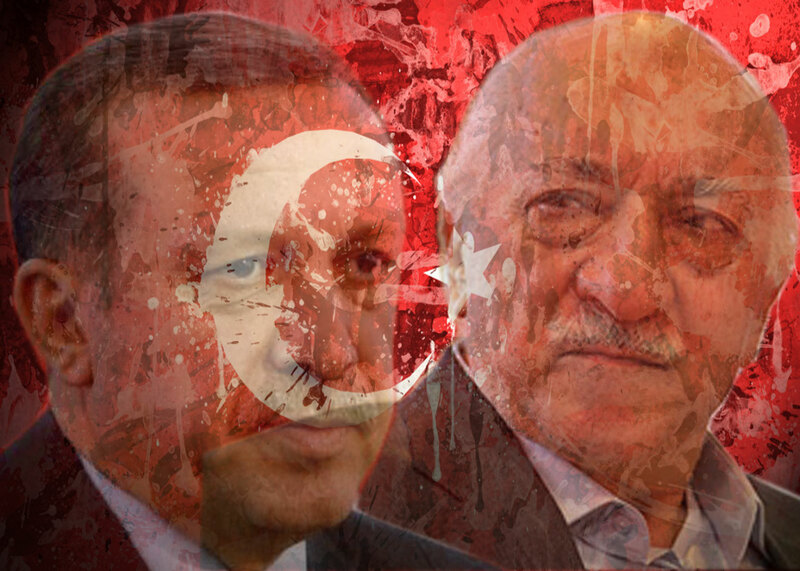 They’re both equally unspeakable, in fact, with Erdoğan maybe only slightly less awful due to Turkey’s more or less democratic institutions—though which are seeming less these days—, institutionalized party politics, and more or less free and fair elections. 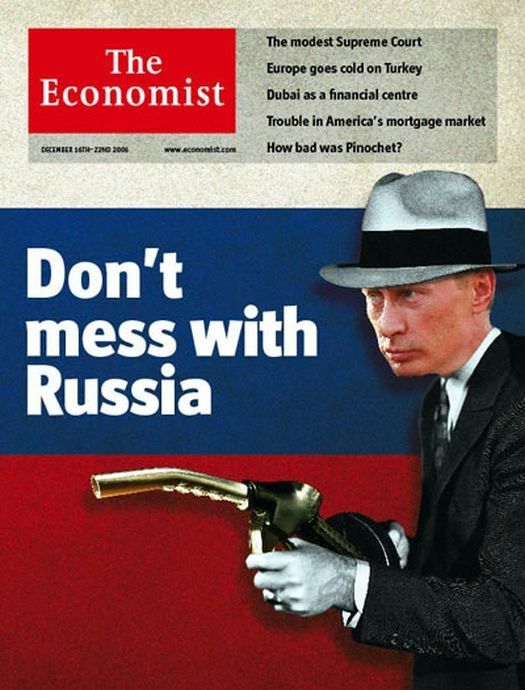 But if Erdoğan and Putin were to switch countries, I would definitely fear Erdoğan more than I do Putin now. Christopher de Bellaigue has a review essay in the April 3rd NYRB, “Turkey goes out of control.” The books under review are Soner Cagaptay’s The Rise of Turkey: The Twenty-First Century’s First Muslim Power and two on the Fethullah Gülen movement, one by Joshua D. Hendrick, the other (in Turkish) by Ahmet Şık. Cagaptay is a curious case. He was a fierce critic of Erdoğan and the AKP through the last election—repeatedly warning in numerous articles and op-eds of the threat the AKP posed to secularism and Turkish democracy—but then did an almost 180° turnaround. Though he doesn’t come out and praise Erdoğan personally—at least not so far as I’ve seen—he’s now bullish on Turkey’s future—economically, geopolitically, etc—under the current regime and expresses not a peep of criticism of Erdoğan and his government, not even during the Taksim/Gezi Park movement last June. So he’s become a sell-out changed his mind. Ça arrive. UPDATE: Zeynep Tufekci, UNC-Chapel Hill prof—and to whom I linked several times last June—, has a very good post on her Technology and Society blog on “The day the Turkish government banned itself from Twitter.” The lede: People in Turkey have banned the ban. I just read (several days late) a full-page op-ed by Belarussian-Ukrainian investigative journalist and writer Svetlana Alexievich in Le Monde dated March 16th-17th, “Poutine et les bas instincts,” in which she describes, almost to her horror, the Kremlin propaganda induced nationalist hysteria that is currently sweeping the Russian population. Russia sounds very much like Serbia in 1990-91, and with Russian attitudes towards Ukraine akin to Serbia back then vis-à-vis Croatia, Bosnia-Herzegovina, and Kosovo. Worrisome, to say the least. Alexievich‘s tribune is translated from Russian. If it exists in English—or if I can find it in Russian—I’ll post it as an update. UPDATE: This looks to be the original Russian—or maybe Belarussian—version.